How many times throughout the day are you interrupted by notifications that impact your focus and concentration? Windows 10 has become very chatty over the past few years with notifications from email, apps, Cortana and more popping up at inconvenient moments. 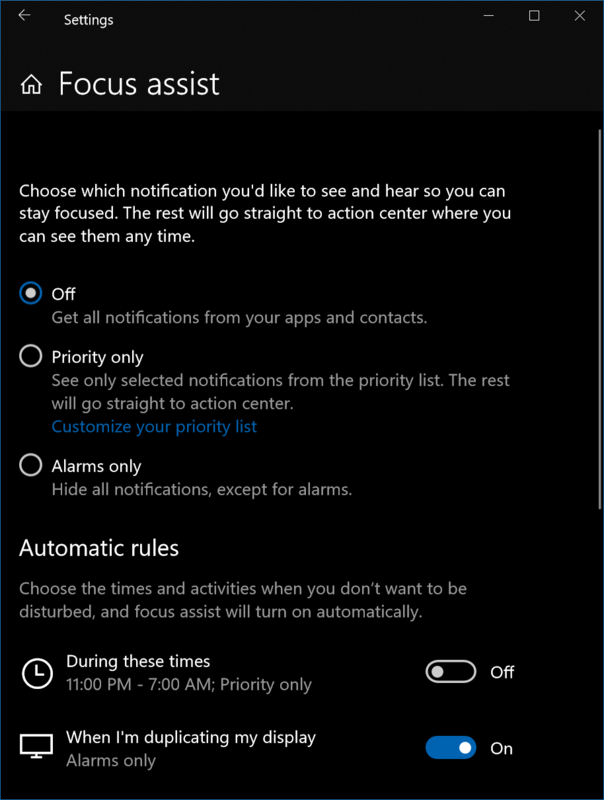 Earlier versions of Windows 10 included a feature called Quiet Hours that would mute these notifications. In the latest update to Windows 10, the feature has been rebranded as Focus Assist and enhanced for more control. Focus Assist can be turned on/off in the Action Center by clicking on the tile. Best of all there is a new “Priority only” feature that allows you to whitelist apps that can break through. For example, you may want to mute all email notification but allow breaking news. All of these settings along with toggling the Automatic rules can be adjusted from within the Focus Assist settings screen. Click on the Start Button, type in Focus assist and hit Enter. Now you can customize Focus assist to function how you want it.